This title essentially covers all the fundamental insights on shipping. Singapore is one of the major shipping hubs in the world. This title essentially covers all the fundamental insights on shipping. Singapore is one of the major shipping hubs in the world. There is a lack of locally produced texts to educate new entrants to the shipping sectors. Due to its broad prospect and vast evolutional nature either in technology or commercial, the acquisition of shipping knowledge should never be deemed sufficient nor adequate. Nevertheless, to start off, one should acquire its fundamentals adequately and this is what this book achieves. The 2nd edition is added with elements and contents that through the author’s observations in the past years, as adequate and appropriate, further required by new entrants to the shipping industry. 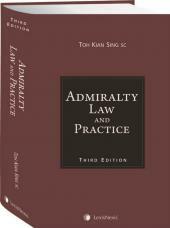 As shipping is a complex and dynamic business, an update in the commercial and legal realms (in an introductory tone) is always necessary, thus this new edition. "Captain Cheong Kwee Thiam Master Mariner GDMLA (NUS), GCIA (NUS), Capt Cheong Kwee Thiam is a Senior Lecturer at the Singapore Maritime Academy, Singapore Polytechnic. He has vast practical experience in the shipping industry having sailed on board tank and container vessels and holding management positions ashore in various aspects of the maritime industry."